1. 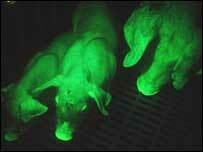 Of course we are all used to glow-in-the dark genetically engineered animals by now. But have you seen glow in the dark pigs that are this bright? (Added: Via Bioethics.net. 2. Rioting in China is getting really ugly. "At least one person, a 13-year-old girl, had been killed by security forces...The police denied any responsibility, saying that the girl had died of a heart attack."